Several staff members of the North-West University’s (NWU’s) campus in Vanderbijlpark recently received long-service awards during the Official Opening of the Academic Year. These awards were given in recognition for uninterrupted and loyal service to the university. When calculating the accumulated years of service, it amounts to 380 years of combined skills and knowledge. Long-service awards were made for 10 years; 15 years; 20 years; 25 years; 30 years and 35 years of service. Professor Dan Kgwadi, vice-chancellor and Prof Linda du Plessis, deputy vice-chancellor for planning and Vanderbijlpark Campus operations, officiated the certificate ceremony. 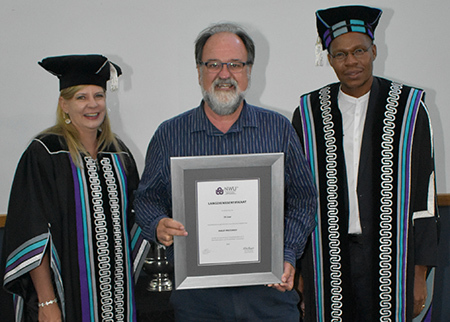 Prof Philip Pretorius from the Faculty of Natural and Agricultural Sciences received a long-service award for 35 years of continued service. The awards were handed over by Prof Dan Kgwadi and Prof Linda du Plessis.